Even the Mario Bros gotta eat. Ever since 2009, the year we first sold our souls to the Angry Birds franchise, mobile phones have muddled the definition of what it means to be a “gamer.” At this point, we’ve all experienced the friend-making (and breaking) power of Words With Friends, and we’ve all gone to Doodle Jump for comfort during tough times. To the dismay of “real” gamers, we’ve all been touched by video games and game culture to some extent. With such a variety of genres and platforms available today, there’s a game out there for everyone, no matter your taste or skill level. Speaking of taste, here’s a list of food-related video games for all you foodie gamers out there. While this list isn’t comprehensive, it should hold you over until we finally see the much-anticipated release of Metal Gear Salad. Kind of like Angry Birds, but 1000x cuter. 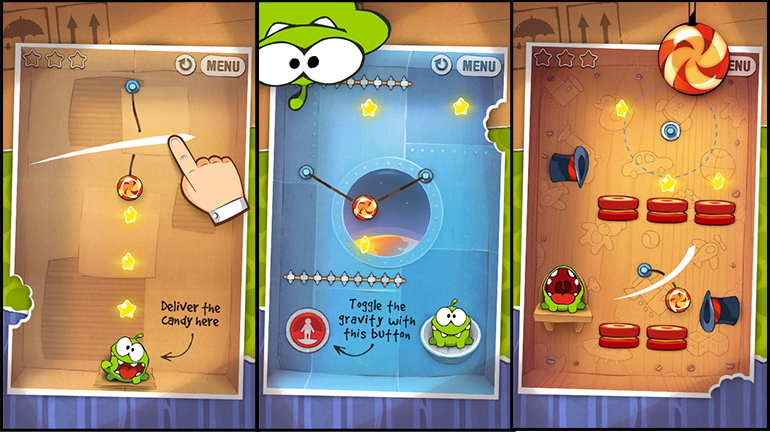 In this mobile game, you solve rope puzzles in order to feed candy to an adorable little green creature named Om Nom. And if you fall in love (I know I have), watch out for Om Nom’s feature film hitting theaters later this year. Chop ‘til you drop with this wildly successful cooking simulation game, where the Cooking Mama herself criticizes your failures harder than Gordon Ramsey during dinner service. If you’ve ever wanted to experience beheading a shrimp (without actually touching one), this game is for you. While there are several versions of Diner Dash out there, the Spongebob version blows all the others out of the water (pun intended). Work at the Krusty Krab and keep the customers happy — lest the anchovies take over once and for all. Photo courtesy of Natsume Inc. 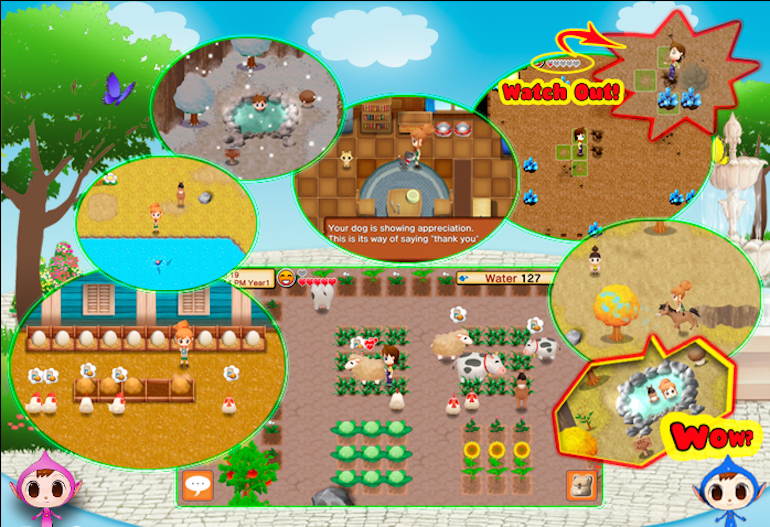 Though it’s primarily a farming simulation game (think FarmVille), Harvest Moon allows players to grow crops and raise animals, as well as use their products to cook various types of foods. However, the games in this series are recommended for more dedicated gamers, since their RPG format requires lots of time and patience. As of 2015, the rebranded version of this game was released under the title Story of Seasons. While this game hasn’t been released yet, it promises to utilize virtual reality technology through the HTC Vive VR headset and controllers. And though the mechanics may seem complex, the premise is simple: Play golf with fruit, while playing as fruit. This couch co-op, set to release later this year, demands communication and collaboration as players work together to prepare, cook, and serve food orders. Racing against the clock, each player has access to different ingredients and tools, making teamwork crucial to the team’s success. If the words “Surgeon Simulator” make you want to punch a hammer through your computer screen, then you’ll probably lose a toaster over the excruciating frustrations of I Am Bread. Like Surgeon Simulator, you control your hero by its individual parts, but in this case, your hero is a slice of bread. Your mission? Become toast. This one is pretty self-explanatory. You are in space, and your team’s goal is to complete all of your recipe objectives. This game also requires a lot of cooperation, as each team member has a unique role on the space food truck. While it’s not nearly as difficult as I Am Bread, this risk-management game is fairly complex and recommended for more experienced gamers. This game is described on its Steam page as a “fast-paced arcade shooter breakfast-hell.” And, well, that’s pretty much what it is. Play as a toaster, whisk, or other kitchen instrument in this insane arcade shooter-style game that’ll have you laughing, confused, and addicted all at the same time.